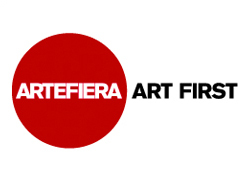 Arte Fiera Art First stages its 34th annual exhibition in Bologna from January 29 to 31st 2010. Founded in the 70s as one of the first ever International fair of modern and contemporary art, under the artistic director of Silvia Evangelisti, brings together art works from XIX Century to the present days and has being set all over the years its identity, playing its role of a showcase for the art market and enhancing new developments in the art scene. 15.000sq, 200 leading Italian and international galleries, are only a few items of the upcoming edition. For the second year, Arte Fiera Art First offers to the audience a daily program of talks focused on the theme of collecting: art collectors and museum directors provide with their experience a dynamic and inspiring dialogue on how private collections and museums interact in the art scenario. The Fair aims to encourage a lively exchange by inviting representatives and collectors from the Asian Pacific Area thanks to the synergy with ShContemporary, the first Asia Pacific contemporary art fair organized in Shanghai by BolognaFiere Group. Arte Fiera Art First is constantly and strongly promoting contemporary tendencies through a section of young galleries sensitive to the challenges of artistic practice, in the art market not more than 5 years, with prices ranged between 500 to 10.000€. Bologna Art First project Bologna Art First a unique art itinerary around the city of Bologna, now at its fifth edition, will be a curatorial project for the first time in collaboration with Julia Draganovic. The project born from the collaboration between the city of Bologna and Arte Fiera, presents from January 29th to the end of February 2010 installations by participating galleries, featuring a unique group show which visually designs a dialogue between contemporary art and unexpected locations, in the historical city centre and its surroundings.